It's cold outside, just right for a warming winter casserole. Ever since I read the wonderful Nourishing Traditions book, we've gone back to eating a bit of meat. That meat is always local, grass fed and free range - never grain fed or feed lot cattle. If that was the only meat we could buy, we wouldn't eat meat. We choose to eat meat on the bone and let the long slow cooking melt the ligaments, giving us a good helping of nourishing natural gelatine, enzymes and minerals. Gelatine is good for our joints and when you start to age, you need all the help you can get. We also eat the marrow from the bones, it's highly nutritious and delicious. This recipe uses local grass fed, free-range shin beef and will serve us at least two, maybe three meals - depending on how big the bone is. 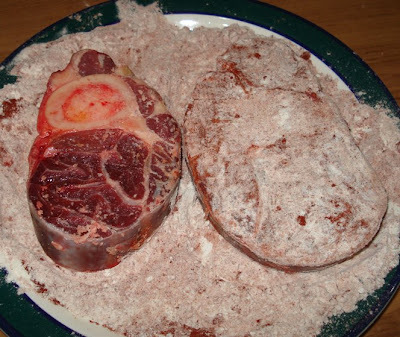 Mix the flour, salt, pepper and paprika together and coat the meat with it. Place some oil in a fry pan and brown the meat. Take your time doing this as it will be the part of the cooking that makes the most difference to the final meal. 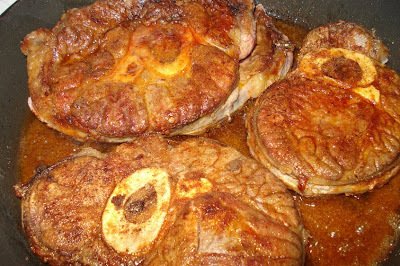 Slowly browning the meat allows the sugars to caramelise, which will give you good flavour and a nice brown colour in the meal. Remember, we're not adding any soups, sauces or other additives to provide flavour and appeal - browning the meat naturally and long slow cooking will do that. When you're happy with the meat, transfer it to an oven-proof casserole dish. I use a cast iron pot with a lid. 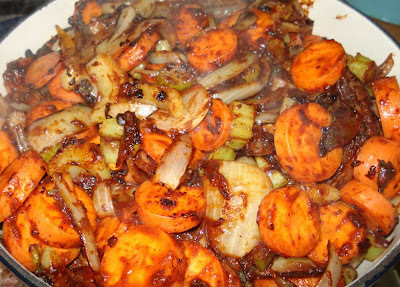 Add the vegetables to the fry pan and slightly brown them as well. When you've developed a bit of colour, transfer them to the pot on top of the meat. Pour over enough water to just cover the meat. Stir the meat and vegetables to mix well. Put the lid on, put it in the oven for 15 minutes on 200C/390F and turn the heat down to 150C/300F. What you're hoping for is meat that will fall from the bone when it's cooked. Test the meat with a fork when two hours is up, you might need to leave it in for another 15 minutes - depending on the tenderness of the beef when you started. This meal could also be cooked in a slow cooker to be ready when you come home from work. 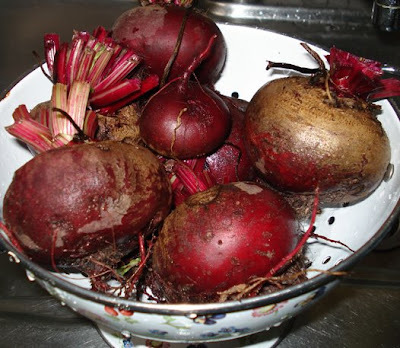 Serve with herb dumplings or boiled potato, along with red cabbage, green beans or chard/silverbeet. 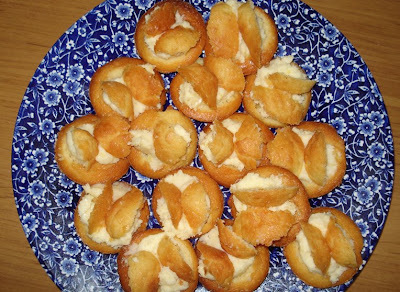 2 cups of self raising flour OR 2 cups of plain flour with 2 teaspoons of baking powder added. Rub into the flour about two tablespoons of softish butter. Rub the butter in with your finger tips, just like you would when making scones (or biscuits in the US), until it resembles breadcrumbs. Add enough water to make a firm dough. 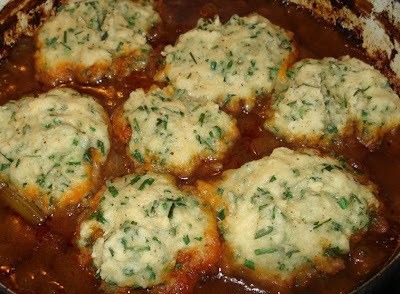 Forms small balls and drop them into the casserole. They will take about 15 minutes to cook so if you're going to add them, do so 20 minutes before the end of your casserole cooking time. I want to thank everyone who commented yesterday on the washing powder post. Sharing our our experiences gives us all more knowledge and ways to tackle problems. So thank you for being involved in this community as well as for your information and knowledge. This post is an answer to another question posed last week. This one is from JoAnna who wrote: I know you've mentioned this before, but I sure would like ideas/help/encouragement for getting others on board. It's like society has certain expectations and it really makes it hard to explain to others (especially my children) that it doesn't have to be "normal" to be in debt up to your eyeballs and anxious all the time. I think it's pretty unusual for both partners to want to change to a simpler life at the same time. Generally one person feels the need to change and then sets off on a mission to convince others in the family. I know you have teenage girls JoAnna, they will be very difficult to get on board. This is my post on Convincing your Partner, it's about how I wanted to change but Hanno didn't, and how we got around that. You have to start with yourself. With any change you need to lead by example. There is not much hope in convincing someone else to change how they live if they don't see evidence of it working well. I'm guessing you've been convinced towards change by reading blogs and books, see if you can get your husband and daughters to do the same. There are blogs written by men, Gavin's is a good example, and young girls, Mia writes an excellent blog full of her hopes and beautiful photos. Please add links to other simple life blogs written by men and teenagers if you know of any, and share your own story if you've been in this situation. But the focus of your effort should be on yourself and how you work in your own home. One of the things that convinced Hanno that we should change was seeing how much money I saved by cooking from scratch, growing vegetables, stockpiling and shopping in a different way. You could probably start making your own cleaners, that would cost less and save on the number of harmful chemicals you have in your home. Who can resist hot homebaked bread? Whip up some bread for them, top it with your own jam or a tomato from the garden and enjoy it with some cool homemade lemon cordial. And when you sit down to this lunch of kings, talk about the reasoning behind it. It won't happen overnight but in small bits - slowly, your actions will show them what the change you have in mind looks like. If you can show that by changing a few things YOU are less stressed, more relaxed, happier AND save money and produce delicious food in the process, that will at least start them thinking that maybe change is not such a bad idea after all. Remember, teenagers are in a time of their life when one of their main motivations is to conform to what their friends are doing - it's how they prove to themselves that they're "normal" and acceptable. You will have to be strong and not give in to their requests for more pocket money and clothes. Tell them they will have to work for what they want, just like everyone else does. But if you can change yourself, if you become more relaxed and provide a warm and secure home, if you show how the changes you've made have made you happier and more content, if you save money and start paying off debt, if you stop buying harmful chemicals and explain to your family the benefits of that, if you grow or cook delicious food and save money while doing it, if you stop shopping, if you provide a loving home that is welcoming, if you do more with less, if you focus more on a beautiful life than a life full of "I want", if you are satisfied with what you have and show it everyday in your attitude towards your family and friends, then you will be well on your way to convincing even the hardest heart that changing in small ways will produce a meaningful and satisfying life full of many rewards. Just a quick post today because I'm going to work and I have a few things to do before I go. It will be a big day there as I'm presenting another Frugal Home workshop. Anonymous asked this question last week: I made some liquid laundry soap from Fel-Naptha soap, borax and washing soda... and my whites are so dingy I can't stand it! When I used the same ingredients but just grated the soap and left it dry, I didn't notice my whites getting dingy. When I was at work yesterday one of the volunteers said the same thing and that she gave up using it because her clothes and linens slowly went grey. I'm not absolutely sure why this happens but I guess the water in different areas must play some part. I always use the powder now. It's easier to make up and store. I have a front loader and I've never had a problem with the powder dissolving. If your clothes are greying or if you have stained clothes, when you make up your mix, add one part oxy bleach like Napisan, Oxiclean. Clorox Oxi Magic or any of the generics. I use the Aldi generic, it's very good and much cheaper than a brand name oxy. Mix it together and use two tablespoons (about ¼ cup) in each washing machine load. I hope that helps. If you've been using another variation of this, or something completely different, please share your secret. More information on oxygen bleach. ADDITION: I love the comments coming in on this topic, especially Toria's suggestion to process the soap in a food processor to get a very fine powder, CJ Stewart's peroxide in the bleach dispenser and the strange one of aspirin in the wash from Kathy. Let's work together on this, ladies and gentlemen, and see if we can troubleshoot the problems some of us have using home made laundry powder. Thanks for all your help, ideas, and suggestions, and for wanting to be involved in finding solutions for our entire community. I cleaned out my work room on Saturday, a job that had been waiting for me since the wedding. 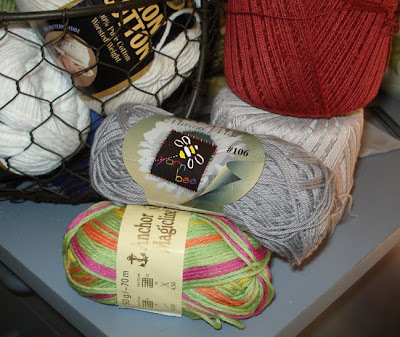 With Tricia and I rummaging in the fabric stash for quilt fabric and thread, and the various other activities associated with the wedding, looking for ribbons and pins, it was quite evident it needed some order restored. 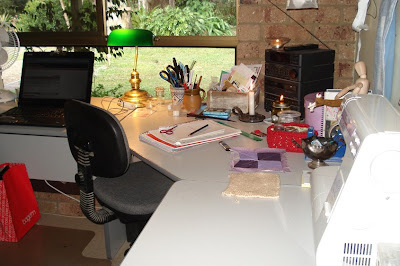 I spend quite some time in my work room now that I'm writing the book every day. My laptop is in there, along with the sewing machine and my knitting supplies so at times it's the centre of a lot of activity. But it's quiet and away from the general pace of our home so it suits me well as a work room. But there was one tragedy - I have two baskets and one box full of wool and cotton, and one of the baskets had been attacked by wool moths! I initially saw tiny white casings, that I since discovered are their skins or shells that they grow out of quickly. Along with the tiny white bits were droppings. Ugh. And, of course, wool that had been eaten through so that although the entire ball was not eaten, they'd eaten through the strands leaving me with lots of strands instead of one continuous one. 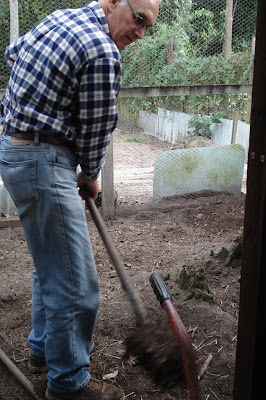 I threw three balls into the compost. It was only the pure wool they went for, they left the cotton alone. 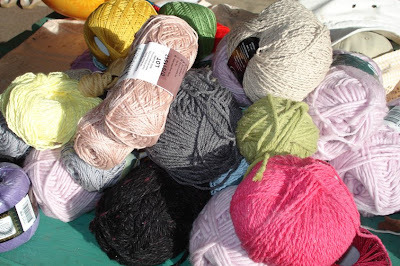 The contents of the wool basket, in the sun, after inspection and culling of damaged wool. These are clothes/wool moths. They're sort of greyish with dark spots on the wings, although I imagine each continent would have their own wool moth. They aren't pantry moths that eat grain. I don't use moth balls or naphthalene. The International Agency for Research on Cancer classifies naphthalene as possibly carcinogenic to humans and animals, but I'll take the simple way, they're killed by freezing. 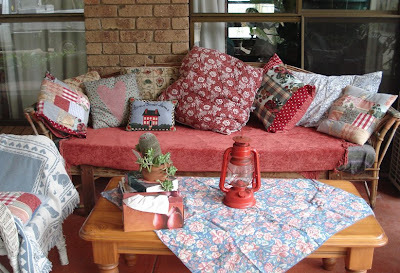 I have emptied my basket of wool and cotton and it's been sitting in the sun on the back veranda. I'll bag it up and put it in the freezer for a week and then store it all in air tight containers. I have learned a valuable lesson. Everything you ever wanted to know about the wool moth. I invite you all to share any information you have on these moths, particularly the keen knitters who have stashes of wool in their homes just like I do. How are you storing your pure wool? 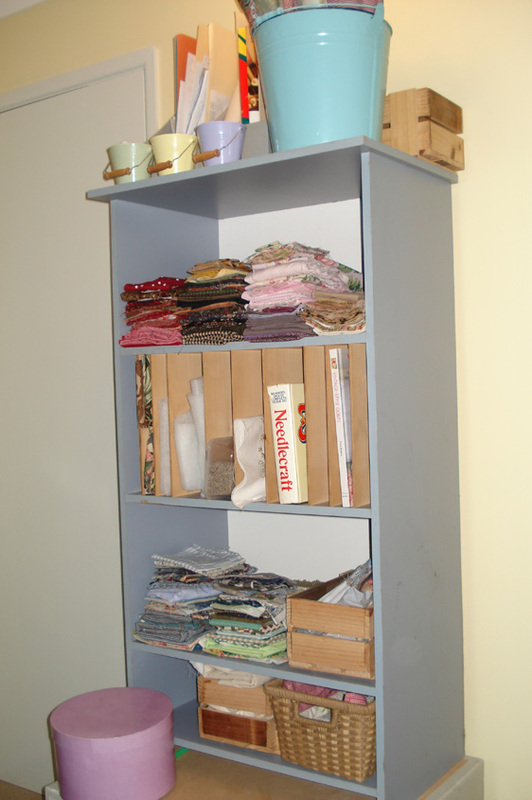 What do you do with the woollen clothes you're wearing, do you store them in any special way when they're not in use? I came across a very good series of You Tube videos on dehydrating foods recently. There are a few there and well worth taking some time for. 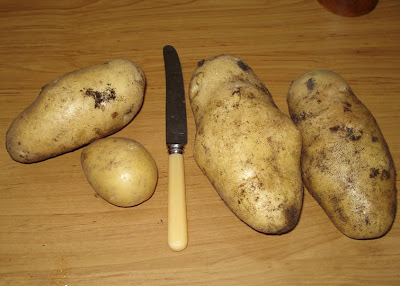 Also, this site has some excellent advice on preserving/canning. I hope you're enjoying your weekend. A reader asked me to write more on dishcloths - she is having problems with the cloths she knitted because they're too thick and don't dry out properly. I had the same problem with some of my Lions cotton cloths. They're fine in summer, but in winter they don't dry out well. I also found some of the thick cloths aren't very good for cleaning delicate things like wine glasses or fine vases. My dishcloths needed to evolve, I needed to make lighter cloths. 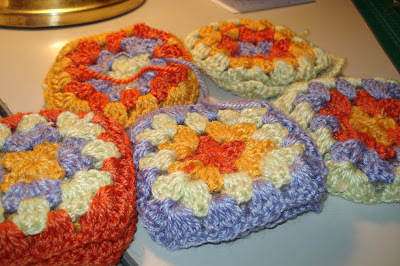 So using no real pattern I made a few lighter cloths using 4 ply cotton or 2 ply cotton - the traditional crochet cotton. If you only have 8 ply cotton, you could try knitting with larger needles to give you a looser weave and a not so thick cloth. I'm really happy with the new cloths - I use a light one about 50 percent of the time. They're easier to work with, especially now it's colder, and I find it's much easier cleaning glasses with the lighter cloth. If you're trying to stop buying disposable items at the supermarket, home knitted dish cloths will fill that spot where you used to buy sponges or cotton cloths from the shop. Eventually they get too grotty to use and most people throw them out. 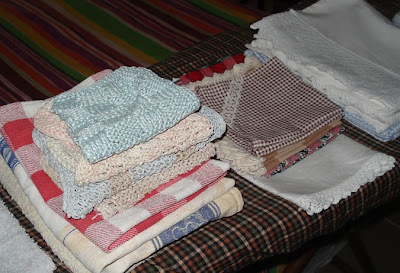 The idea behind the cotton dishcloth that you make yourself, is that it's stronger and therefore can be washed with the normal washing many times before it starts showing signs of age. I have cloths here I've used for three years and they're still going strong. 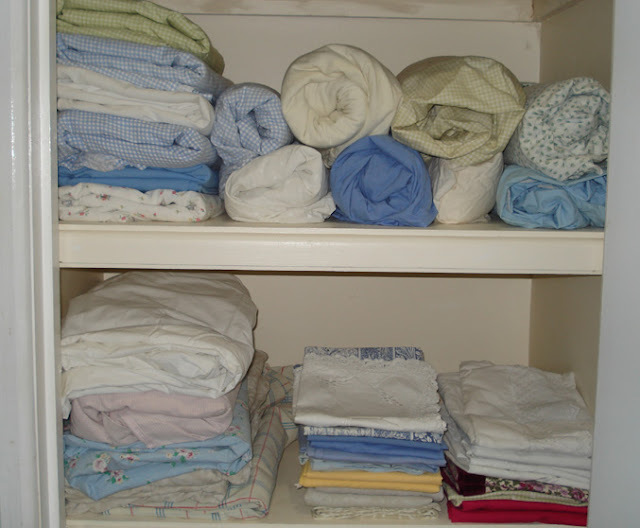 I usually have about 15 - 20 cloths in my wire basket waiting to be used at any one time. I can change them every day if I want to but usually change them every second day. They're highly absorbent and can be used for a variety of household chores like dusting, cleaning, and polishing. I use different cloths in the kitchen, the laundry and the bathroom. All are colour coded so I know where they go back to after they've been washed and hung in the sun to dry. This is 4 ply cotton at front and 2 ply at back (red and beige). 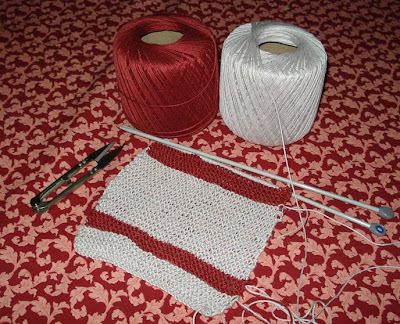 Knitting dishcloths is a good practical exercise if you are new to knitting. It will teach you your basic stitches and in the end, you have something you can use in the home. 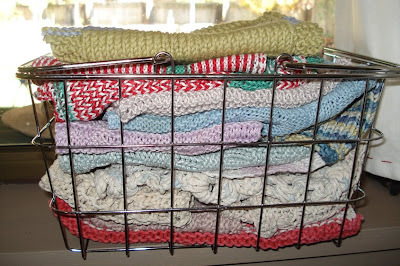 Do enough dishcloths and you'll slowly gain the confidence to tackle larger items. Keep in mind, you can practise any new stitches on your dishcloths before you try them on a jumper or scarf. 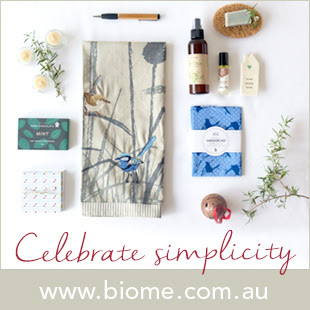 One of the best gifts to give either man or woman is a bar of home made soap and a knitted wash cloth. So if you haven't yet fallen for the old fashioned charms of the knitted cloth, think of those gifts and grab your needles. Here is a lovely pattern for a knitted cloth from I live on a farm. And some new (to me) patterns at Tipnut. A link to the type of cottons I'm talking about. Next in the series of readers questions is how to start living simply. Well, the answer to this is to know why you want to simplify your life. Is it because you feel stressed all the time? Are you concerned about the chemicals in your life? Are you moving to another house and want to change the way you live along with everything else? Are you trying to save money? Or are you tired of living with debt and stress and long to return to a gentler way of life? There are probably as many reasons to simplify as there are people reading this post, so let me tell you where I started and maybe that will work for you too. When I stopped working for a living I had not thought about simplifying but I had grown up in the 1950s and remembered a life much simpler than the one I was living. 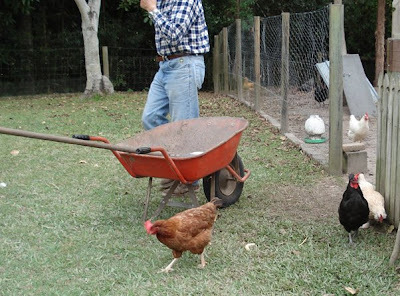 Before I married, when I lived in isolated parts of Australia, I stockpiled, I gardened when I was younger and the first pets I ever bought for my sons were chooks. Those chooks taught them so much - about gentleness, attention to detail and the never-ending responsibility of providing food and water for pets. I have been 'green' most of my life but had never reflected that in my life consistently or with conviction. I suppose I was ripe for the picking. I wanted to live in a different way, I wanted to leave the stress of "normal" life behind me, I wanted to slow down, be quieter and more in touch with my family and my natural surroundings. And while I did all that I wanted to open myself up to whatever my life would hold at this point. Whatever was out there I wanted to "know it by experience" as Thoreau would say. I looked forward to collecting eggs and honey, to growing food fit for a king's table and living a meaningful life. I wanted to say goodbye to gossip, meaningless celebrities, greed and having everything at any price and hoped to discover a world where grace, respect and enrichment filled the sweet air I breathed. Boy, did I hit the mother lode when I started to slow down and live according to my values. It was all there; I found what I hoped for and much more. I started by organising my money in more accountable ways, by making a budget and sticking to it and by cutting back a lot on what I was buying. I shopped in a different way - what used to be one chaotic weekly trip to the supermarket and a few other trips back to pick up things I'd forgotten, turned into a planned monthly shopping trip. We started planning our trips out and doing as much as we could each time we went out instead of making a lot of little trips for one or two things. I started stockpiling, then my grocery shopping was even less frequent. 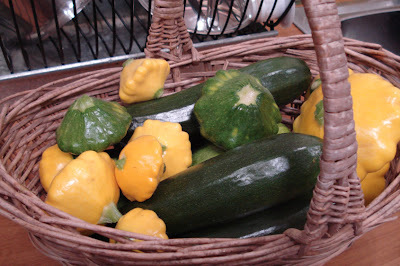 This gave me a lot more time at home and that time was put into the vegetable garden. Over the first few years we produced vegetables only during the cooler months, having summer as our down time, but as we came to rely more on the garden produce, we continue planting year round. 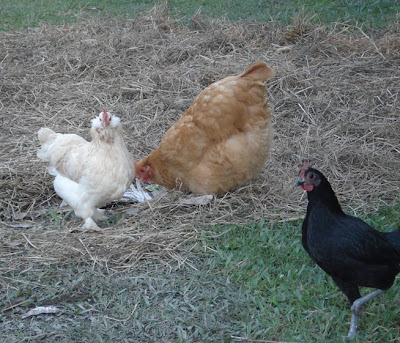 To help our garden produce at its best, we have compost brewing all the time, we added a worm farm for castings and worm tea, and of course, we always have chickens in the backyard. We bought our first about 25 years ago when the boys were little and we still enjoy the clucking outside. The backyard wouldn't be the same without the chooks. At the moment, we're building up our fruit production. We had lemons, bananas, loquats, oranges, pecans and passionfruit since we arrived here, in the past few years we've added pink grapefruit, mandarins (clementines), blueberries, red paw paw (papaya) and avocados. I started preserving/canning and freezing to save various excesses in the garden and to be sure we had good home made sauces, relishes and jams. I have always cooked from scratch so no changes there but we did stop buying the occasional takeaway meal and I developed a set of fast food that I could make at home. I also tried my hand at cheese making, fermenting - sauerkraut and vinegar, and baking. 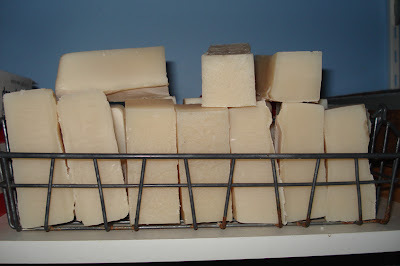 In an endeavour to cut costs and stop bringing chemicals into our home I started making homemade cleaners and vegetable oil soap. This is one of the few areas Hanno isn't quite fully onboard with yet. I use the homemade soap to wash my hair but he's using a Neutragena shampoo at the moment and he still buys detergents ever so often, but he's promised to not do that in the future. He loves the homemade laundry powder and the other bicarb, lemon and vinegar concoctions I use, so we haven't gone too far off our course. 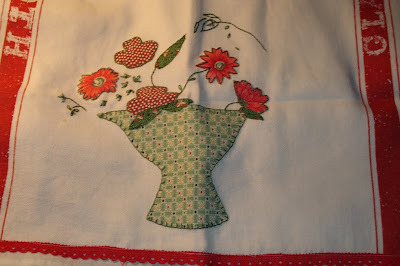 I love knitting and stitchery but the truth is I see them as part of my housework. I mend rather than throw out and I look after what we own so we use everything fully. I knit for the pure and simple reason that we need knitted dish cloths and face cloths and various woollies for winter wearing. I'm knitting a pair of fingerless mittens for Hanno now and will then knit him a pure wool jumper (sweater). Handiwork also provides gifts for giving throughout the year. Our gift for Shane and Sarndra at their wedding last month was a queen size wedding quilt. It was a gift I felt really good about giving them and they accepted with gratitude, I'm sure they'll treasure it for a long time. But there are also smaller gifts for birthdays and Christmas and more and more I'm finding people appreciate the time and effort that has gone into a hand made gift. So as you can see, once we started living a more simple life, one thing lead to the next and it grew organically to what we have today. I think most plans will develop themselves once the first step has been taken; it's always that first step that's the most difficult. And make sure you remember that my life and what I've just described for you certainly isn't the only version of a simple life. You don't have to give up work or wait until your children leave home and you don't have to be living in the country. You can do this anywhere, at any time. Cut back on your spending, look at the way you feed yourself and change what you can for the better, teach your self how to bake, sew, knit and whatever you do, be pleased with what you achieve, don't dwell on what you haven't done. That will be waiting for you when you can manage it. So now to the important part - we've talked so far about the practical side of simplicity, but you also need to think about yourself and your life in a different way, and you need to slow down, stop multi-tasking and be kind to yourself. As soon as you make your first step, say to yourself that you're living simply, tell others, if they ask, that you can't go shopping with them because: "I decided to live more simply, I won't be going out shopping very much now. I'm saving to pay off my debts." Just hearing yourself say that will affirm your change. Build on it by thinking about your life and your changes every day. This way of living is as much about how you think about yourself and your life as it is about the practical things you do everyday. If you do many of the things I've described but still think of yourself as a shopper and long to get back to the mall, that is where you'll end up. You have to develop a simple mindset. Think about the values you want to live by. I want generosity, kindness, grace and respect in my life, and I consciously work on ways to live to those values. If you can, take time out for yourself every day. Think about ways you can reconnect with your family and how you can develop your simple life. And then, just do it. Day three of readers questions and this subject seems to be a favourite one here - homemaking. I really enjoy writing about this because I think we don't have enough homemaking role models and, as a job, it's often devalued by people around us. And why is that? Why is homemaking as a career seen as such a dull and dead end thing to do? I think it has a lot to do with money. Homemakers aren't paid in hard cash, homemakers, my friends, are paid in love and the warm affection and appreciation of a close family. But it's not worth the time worrying about how we are viewed. Like most homemakers I just get on with the job and let the comments land where they may. I know that my life is better now that I take care of my home and family as my main concern. It wasn't always the case. 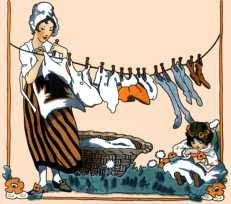 I used to dislike housework and paid for home help when I was working outside the home. That kept me at arm's length and I never really knew the significance of caring for a home until I gave up work and came home. I really returned to my home in its fullest sense. I stopped the nonsense of not wanting to do housework, and that was the making of me. I realise now that the day to day tasks of homemaking - the bed making, sweeping, cleaning, laundry, cooking and a hundred other things, created the person I have become. Those tasks slowed me down enough for me to focus on my work, to value it and to see that making a home comfortable, safe and warm remakes me and gives my family a gift like no other. What else could help prepare our families for their day as much as a warm, clean bed, a good healthy breakfast and encouragement as they walk out the door? Where else but at home could we raise our children with a feeling of being loved, safe and wanted? Who else could stand as a strong role model for a child but a loving and confident homemaker who teaches by example the values of self confidence, hard work, honesty and common sense? And BTW, I think common sense is not so common and it is a skill to be taught like any other. My children have left home now and are building good lives for themselves. 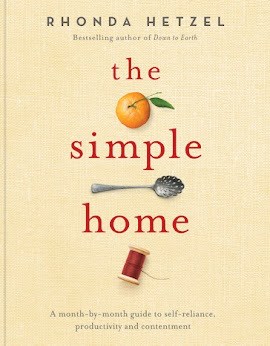 Now my homemaking nourishes Hanno and I. I am grateful that I came home when I did and discovered the true feeling of living well in a place of my own making. Nothing else gives the satisfaction of knowing that the efforts of my day give me a place to land when times are tough. I know that we can regain our strength here, no matter how hard we have worked, and I know that whatever I put into my home is returned to me ten-fold. 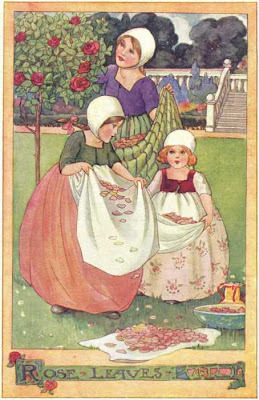 There is a lot to be said about the art of homemaking. 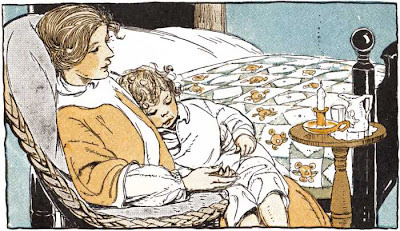 I could write here all morning about the tasks that build character and demonstrate love and care but what I want to encourage in you is the knowledge that no matter what you hear or read about being at home with your children, what you're doing is one of the most important things you'll ever do. Don't listen to the naysayers, don't judge yourself or your calling to be at home by what others may say about it. Keep reminding yourself that nurturing your family with the results of your daily homemaking tasks help make you and build character. Know, deep down to your core, that raising children to be decent, hardworking people who will go on to contribute to their country and build their own family is as important a job as any other. I have just had two days at work, today I'll be here at home all day. Nothing makes me more content knowing I can potter around, doing this and that, getting through my daily tasks. 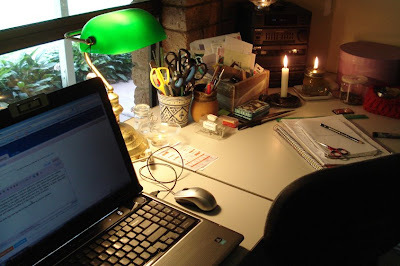 Hanno will wake soon, we'll have breakfast together and then start our work. 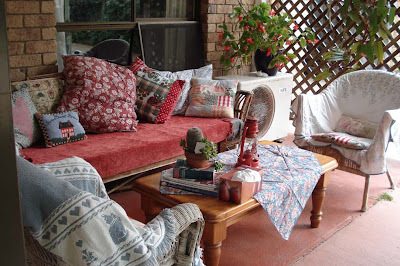 He will probably be outside while I work inside but we'll meet for morning tea on the front veranda later in the morning. Morning tea together, sitting in the sun, talking about our plans, is one of the rewards of this life for us. It's a simple thing but it symbolises the gentle nature of our lives now, rewards us for what we've already achieved and sets us up for what is to come. The rewards of being a homemaker are many - they may not involve cash but they're there for the taking, and they are renewed everyday simply by working in our homes. I have to be honest and tell you that I'm not a real believer in the repellent kind of companion planting. I think that a few plants benefit being planted together, but in my experience it's not many. However, I am a big fan of flowers in the vegetable garden that help attract the right kind of insects. That kind of companion planting works very well. Here is a list of companion plants. The repellent plants I think work well in the garden are marigolds, wormwood and nasturtiums. Marigolds help rid the garden of nematodes, and nasturtiums or wormwood are good planted close to the cabbage family as they attract the white cabbage moth away from the plants. 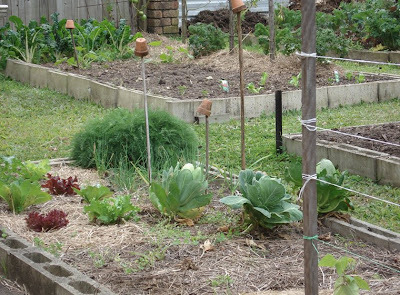 There are a lot of flowers that will serve you well in the vegie patch. Of course you need bees and other pollinating insects if you're growing flowing vegetables like tomatoes, beans, pumpkins and potatoes. Bees are attracted by most flowers because they collect nectar to make honey and pollen to feed to the larvae. Going from flower to flower to collect as much as they can before going back to the hive, they take pollen from one plant to the next and help with plant fertilisation as they go. 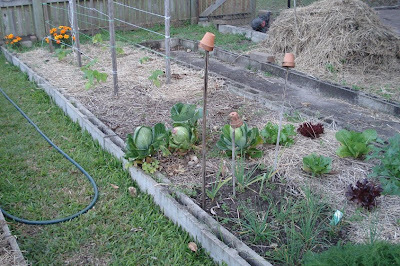 Flowering plants are a must in a vegetable patch. Some of the best include: allysium, red clover, Queen Anne's lace, cosmos, coriander, parsley flowers, dill, small daisies and lucerne. There are plenty of other good insects you'll want in your garden, like lady beetles, lace wings and hoverflies. Beneficial garden insects are listed here. And yes, it lists spiders and some wasps as being good bugs. If you're afraid of spiders and stinging insects, I encourage you to sit in the garden one day when it's sunny and just watch the insects at work. They won't take much notice of you but you'll see them working away for their own benefit, and for yours. If you don't try to kill them or catch them, they'll stay out of your way. 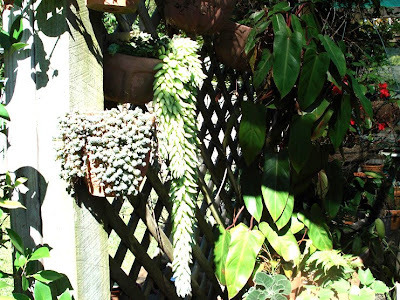 They're part of the natural environment you're trying to reconnect with out in the garden, so work with them, not against them. 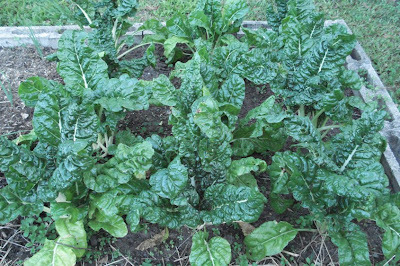 Here is an excellent site containing information about organic pest control with some recipes for natural garden sprays. But there is no replacement for the time honoured tasks of weeding and observation. If you weed out all the places some insects use to hide and overwinter, you'll get rid of a big problem. And going into the garden to look at your plants as often as possible will show you straight away if there are caterpillars chewing on leaves or tiny black spots that indicate insect activity. 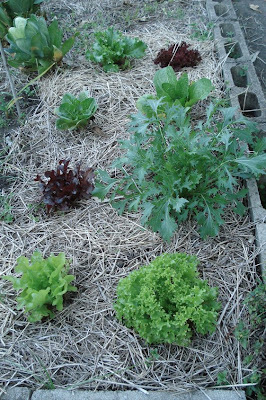 If you can get into the habit of looking, and picking off the bad bugs you find, you'll be on your way towards a healthy organic garden. This week I'll be answering the questions asked by readers last week. The first is on retirement. I guess we fell into retirement without thinking too much about it. Well, maybe I did that, Hanno probably didn't, he's very careful and always plans, especially when finances are involved. 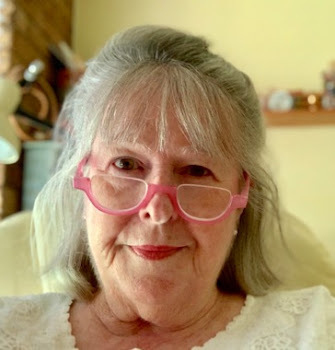 Nevertheless, we both found ourselves "retired" - he is well and truly over retirement age (65 years) and gets a pension, I am still under retirement age and earn a bit of money writing. We are among the first of the baby boomers, and in Australia, the laws on superannuation (401K) only came into being during the early 1990, so we didn't come to this life with a pile of cash sitting in a retirement fund. Very few early boomers have cushy little nest eggs on which to travel the world and those who do would probably have lost a lot of it during this recession, if they invested in shares or real estate. We have a few shares but they lost a lot of value in the past year and I have a small amount of superannuation cash waiting for me when I turn 65. I have never believed that we needed anywhere near what financial planners say you need - it's something like $500,000 per person! We live on less than $25,000 a year and pensions well and truly cover that. Of course, it depends on how well your own country provides for its elders ,but it also relies on debt - if you do have debt, it would be very difficult to retire on a small amount. We are lucky and paid off all our debt many years ago, we own our home and we're in good health. Health plays a part too, and we have kept our private health insurance - that is covered in our $25,000 a year. We do have free medical and hospital care in my country but it's slow, you go on waiting lists, and we want the comfort of knowing we can have the best of health care if either one of us is ill. But I don't want to make this post solely about money, because if you live as we do, while money is important, it's not the most important thing. And please note, I am not a financial adviser, have never worked in any industry connected with banking or investments and I'm merely relaying our circumstances to you so you can understand our retirement, and maybe work on your own plans. If you plan on a simpler lifestyle when you retire, yes, pay off debt first and put away some money, but above all else, develop a set of skills that will help you live the way you want to live. Learn to cook from scratch, learn how to bake, sew and mend, Work out what you'll do with an over abundance of vegetables - will you freeze or preserve/can? While you're still working, buy the tools and appliances you'll need to do all those daily and seasonal tasks. Look critically at your home, will it support you in retirement? You'll have a lot more time to work at home - time to produce food in the backyard, raise chickens for eggs or meat, harvest honey from bee hives. Will you be able to do those things where you are now? 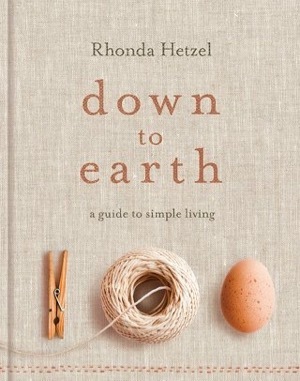 Do you know how to sew, knit and mend? If you answered no, now is the time to learn. What about home maintenance and supporting your lifestyle with home servicing? Doing your own will save a lot of money. Learn how to unblock drainpipes, change the oil on the car, service the lawn mower, and clear the guttering on the roof. These activities will not only save you money, they'll fill your hours, keep you fit and active and give you purpose. Instead of working for a living, you'll be working for your life. Get used to not buying clothes and shoes every year - fashion is overrated anyway. Develop your own style that is plain and simple and be proud that you've stared down the fashion police. If you don't already do it, buy the best quality you can afford and products that can be repaired. You want things to last as long as possible so look for value for money instead of the cheapest price. If you are both working, see if you can live on one income now, and save the other income for buying water tanks, solar panels or a reliable, and cheap to run, car. I encourage you to do all these things and also to think about your life and what will make you happy. Living simply is a lot of work and as long as you go in knowing and embracing that you can't go far wrong. You will be disappointed however, if you think this life we live is easy. It's satisfying, enjoyable, rewarding and wonderful but it's not always easy. You have to really know that. But if you want to feel content with life and proud of what you do for yourself, if you want to take your life by the collar and give it a good shake, then this is the life for you. We can do whatever we feel like doing most days, we have the satisfaction of growing some of our own food, eating healthy food, taking each day slowly and we grow confident knowing we can look after ourselves, even if a major disaster occurred. We have grown closer to our own lives, we provide the raw materials for many of the things we need, we aren't passive bystanders any more. 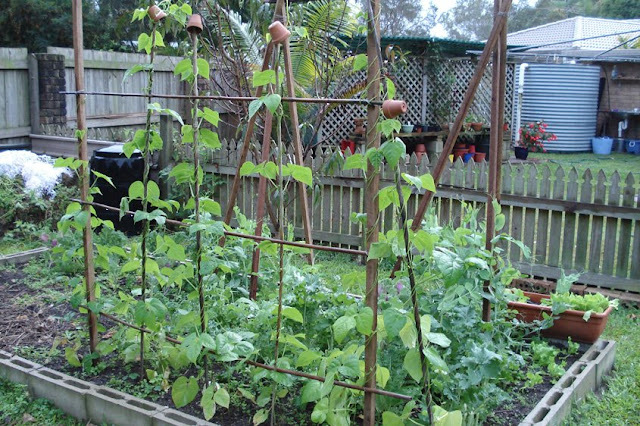 I guess our example shows that if you have no debt, own your own home, have the space to grow some food and the knowledge to put some of that food up for later in the year, if you can conserve rather than spend and be happy doing that, then this kind of retirement may suit you too. It's probably the opposite to what a mainstream retirement is - whereby you save and invest as much as possible so you can stop work, relax and travel. We look forward to the work we do now, because the work helps give purpose to each day. So if you are looking for a retirement that keeps you busy, entertained and thoughtful, if you want to feel in control of your life, if you are prepared to do simple honest work for the rest of your life, then start preparing for it now - in developing your skill set that will deliver to you a life like no other. I am here to show you it is possible, the hard bit is up to you - are you ready for it? I watch Compass every week and saw this BBC program last week. It's a very interesting look at two Amish families in Lancaster County. You can watch it from the Compass site. What has the recession taught you? Although it started off slowly, the world wide recession seems to have hit many countries pretty hard. Unemployment has taken a toll, so have marriages - I read recently that financial problems have pushed many couples to breaking point. There is no doubt about it, this recession has destroyed the dreams of many and made a lot of people reassess how they live. However, I believe we can learn a lot in times of stress and hardship. These are times when we tend to look more closely at ourselves and re-evaluate our lives and values. When the economy bounces back again we will be stronger because we usually learn harsh lessons and make difficult choices only when we have to. When the good times return, although many will spend more again, those lessons will be remembered and become part of who we are. My parents and many other older folk were, in part, shaped by the depression, we are being shaped by our times too. Living with a thrifty mindset does me good. 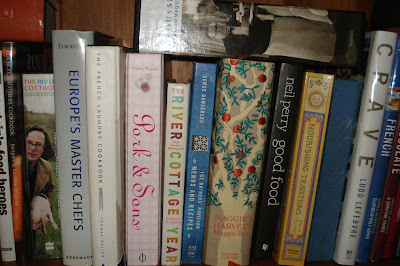 I don't need any convenience food - from scratch and slow foods are healthier, delicious and cheaper. I enjoy the struggle - having things too easy makes me soft. I feel more in control of my life when I have a purpose to each day - the purpose being not to go under and to make as much as I can with what I have. 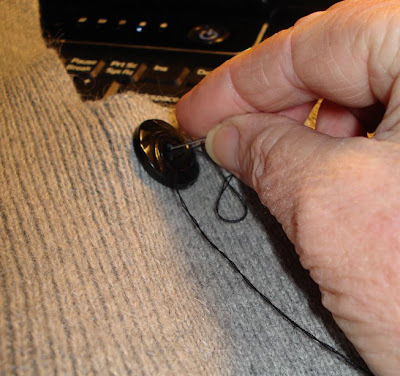 Mending and hand stitching is relaxing and enjoyable. Family and friends are priceless. Helping others gives me an immense feeling of satisfaction. We are living on about one quarter of what we used to live on, and we are thriving and happy. Taking responsibility for myself makes me stronger and more confident. I need to rest and get enough sleep - having a strong immune system is essential in tough times. Simple life tasks like baking bread, cooking from scratch, harvesting water, change me from being a passive follower to a proactive leader. When the recession is over, I'll be pleased but I'll take all the good I can from it. And the thing that shines like a beacon for me now is that living simply is joy in good times, but when things are tough is can be the difference between make or break. It's been quite a while since I posted about making fairy cakes. I promised to give you the recipe, so better late than never, here it is. I made mine in a gem scone pan and didn't use paper cases. Preheat the oven to 180C (350F). Line a pan with paper cases. 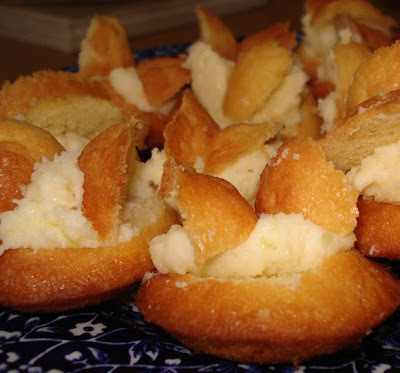 Place the flours, sugar, butter, eggs, milk, lemon and vanilla in a large bowl. Using an electric beater, beat until combined and fluffy - about 2 minutes. Bake for 20-25 minutes until golden. Leave to cool in the pan for 5 minutes, then turn out onto a rack to cool. Fairy cakes can be made with the addition of vanilla, chocolate, orange or any other natural flavouring you have on hand. When the cakes come out of the oven, let them cool, cut the top off, add a teaspoon of cream or butter cream, then cut the top in two to make the wings and stick them side by side into the cream to stand up like little wings. 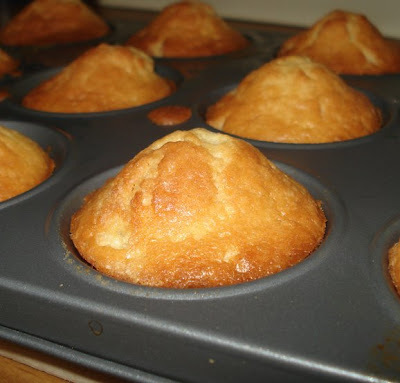 I noticed there are a lot of recipes online for iced/frosted cup cakes that are called fairy cakes. True fairy cakes have wings and in Australia we used to eat fairy cakes, not cup cakes. Cup cake is an American term. Another lovely thing I wanted to share with you is this sweet tea towel (above) my sister made me when she was here for the wedding. It's appliqué and stitchery and it's got an authentic old fashioned look that really appeals to me. I'm not sure I'll use it as a tea towel, it will probably serve me well as a little tray cloth. Don't you just love homemade things. These little household items, made with love, really make me feel warm and comfortable when I use them. The making process isn't long or involved but they stamp the home they're in with an authentic feeling that sits well apart from mainstream mass production. Thank you Tricia! Hanno and I are going to visit Shane and Sarndra today and will have lunch with them. Everything has settled down since the wedding, they've returned to work and it will be nice to be together to celebrate Shane's birthday, which was yesterday. I am really enjoying getting to know my new daughter-in-law. I'm taking her a little gift of dishcloths, vintage knitting needles, a needle gauge and some knitting cotton and bamboo. Sarndra loves craft so I think she'll enjoy this little starter kit. Thank you for your lovely comments in the past few weeks. I am often overwhelmed by the words you write both in comments and emails. I don't know what I've done to have such a wonderful group of readers, but here you are! Amazing. Enjoy your day and take time to enjoy something you love doing too. When we first moved into our current home, we made quite a few changes. 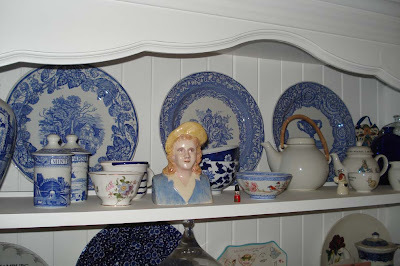 The house had been lived in by an older couple and some of the things that suited them didn't suit us. We pulled up the carpet and laid a wood floor, we changed the kitchen, added verandahs front and back and put in gardens and the chook house. We, although we didn't know it at the time, were getting ready to live more simply. It's very easy to look at a new home and see spaces you don't really like, or know they won't work for your family and just ignore them. I want to encourage you to change what doesn't suit you. If you don't, you're changing yourself to suit the house. We all have different circumstances and expectations but all of us can benefit from changing our living space to suit how we live. 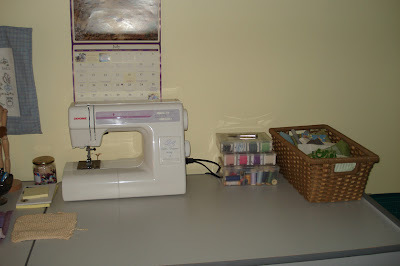 For instance, if you do a lot of sewing, you should have a space to store your equipment and fabrics; if you write or paint, you should have a quiet space to do it; if you bake a lot, have all your needs close to where you work. Outside, your mower and garden tools will serve you well if they're stored in a space out of the weather and close to a work bench were you can carry out your maintenance. 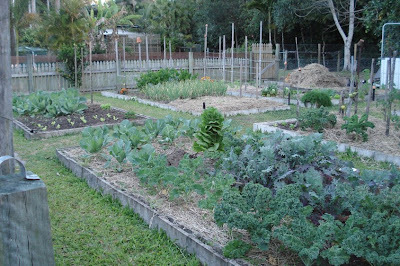 I guess the obvious and easy change is to create garden beds where there are none and to build a chook house or tractor. 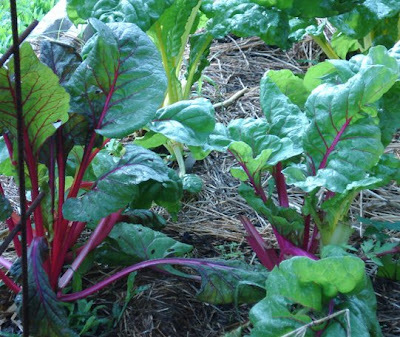 That change alone, while not costing the earth will equip you to provide a measure of fresh food right from your home. But there are other less obvious changes to be made, you just have to look at the space around you in a creative way with a focus on your sustainability. Out in the back yard, along with the gardens and chickens, you could think about water tanks or barrels. If you don't have the finances for that now, it might we something worth saving for if your climate is fairly dry, if you get all your annual rain in a few months, or if you have a vegetable garden. 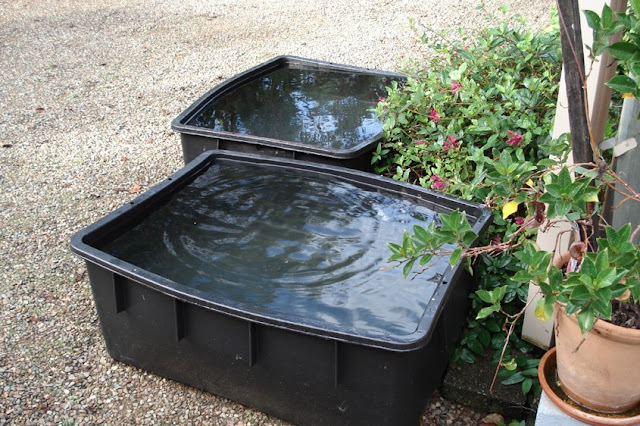 And even if you don't have the money for big tanks right now, see if you can set up a system whereby you collect some water when it rains. We have a couple of 200 litre tubs here that, when full, can keep our garden going for a week. 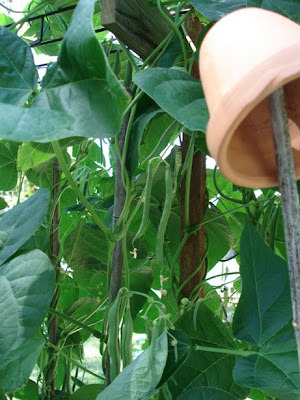 We just fill the watering cans or buckets from the tubs and transfer the water to the garden. It's more work than hosing, but we don't mind carting our harvested water the short distance. Make sure you set up your collector tanks close to where it will be used. Btw, mosquitoes take about 10 - 14 days, depending on the type, to go from egg to mosquito. 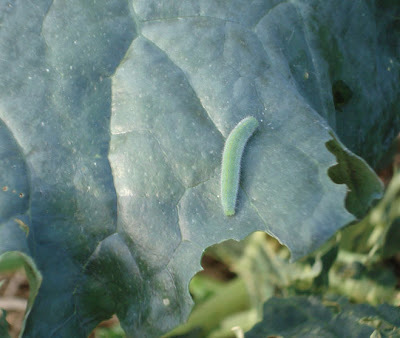 Harvesting the water within a ten day period will kill the larvae before they fully develop. Or, you could just scoop the larvae out with a fine fish net. Inside the home you might look for a cupboard to store your stockpile. 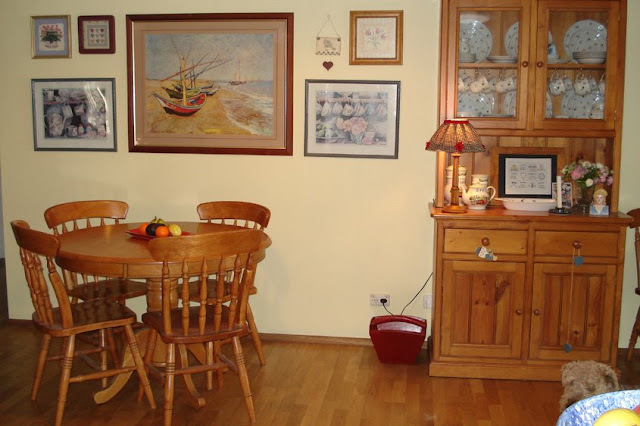 I think one of the downsides of many modern homes is the lack of cupboard space. Think creatively about your cupboards, if you have a big cupboard near your kitchen, or in the laundry or garage, that may suit your stockpile better than what is currently in it. Move pots and pans, baking supplies, tea and coffee making supplies close to where they're used. Organising your kitchen well will save you a lot of time and effort. It just takes an hour or so to think about how you work in your kitchen and then moving things closer to where they're needed. Make a space to sit with your tea and coffee. This space might also serve well as the place you talk quietly with your partner, read to the children, write letters, knit or stitch. You need a space like this just as you need a place to store your linens or groceries. Make a space for yourself - make the house suit you, not the other way around. I could go right through the house but I'm sure you get what I mean. Making small changes to your home will make your life easier. Modify the house to suit the type of family you are. Make the spaces work for you and if they don't, change them. Your home is one of the key tools you have in your life, making a few adjustments to make it work as it should and have it accommodate the activities of your family, will make living there easier. There will be some changes that cost money, just do them as the money becomes available, but many changes will cost only the effort you put in to make them happen. I hope you identified some changes you want to make when we did our simple audit last week. So if you have some plans, I encourage you to dive right in and enjoy the process of change. You'll be making your home fit your family instead of living with the feeling that the house isn't quite right. This is another one of those things where we take the bull by the horns and give it a good shake, instead of sitting back wishing things were different. Do it thoughtfully, take it slow and enjoy the change. I mentioned a few days ago that I was working on a little oil lamp. Well, I fiddled with it for a few days, tested wicks and oil levels, I now have a perfectly serviceable oil lamp that burns clean for hours, with no smell. I was looking for a replacement for paraffin candles and saw a photo of a small oil lamp on a website somewhere but when I made my own version of it, it burned for a minute and went out. I never give up on these things so it was a battle between me and the lamp for a day or two. Let me tell you we both won. I won because the lamp burns as I want it to, the lamp wins because it looks good and gives a lovely mellow yellow glow, just like a candle. All you'll need to make one of these lamps is a small glass jar with a lid that fits properly, a short strip of pure cotton or pure linen, a small amount of oil and water, and a plate to sit it on. I used a small canning/preserving jar - the one above is about 350 ml (12oz) but when I make another, I'll use a smaller jar of 250 mls (8½ oz). The lid needs to attach firmly. You could use recycled jars as long as it's sturdy thick glass. Poke a hole in the lid with a can opener or a hole punch. Half fill the jar with water and then carefully pour oil onto the top of the water to fill the jar almost to the rim. Push the pre-soaked wick through the hole and have it sitting about ½ inch above the lid. 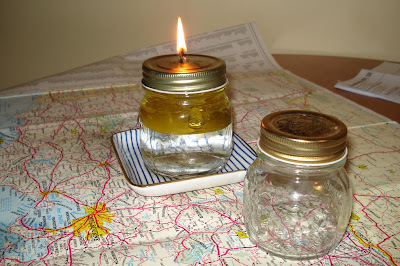 If the wick goes out soon after you light it, add more oil so the oil level is almost at the top of the jar. Having the oil close to the lid seems to give the greatest chance of success. A short pure cotton wick, with pinked edges. Wicks: natural wicks work best. 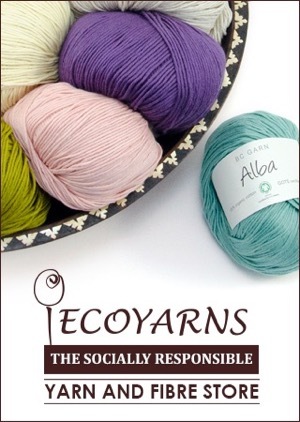 A polyester or poly/cotton blend will smell. 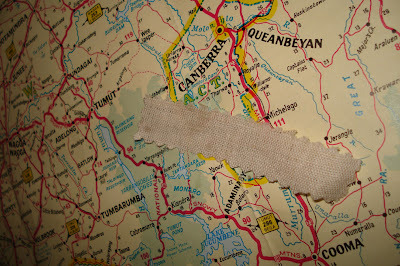 Find an old piece of loose weave pure cotton or linen fabric and with pinking shears or scissors, cut a strip 1.25cm (½ inch) wide and 10cm (four inches) long. Soak the wick in oil before using it then poke the wick through the hole in the lid. Have it sticking up slightly above the lid top. I also tried plain kitchen string/twine, Lions knitting cotton - one strand and three strands plaited/braided together, and cotton dress fabric - all worked quite well. Don't forget to pull the wick up every so often as it will eventually burn down too low to work properly. Do this with a pin and while the lamp is not lit. 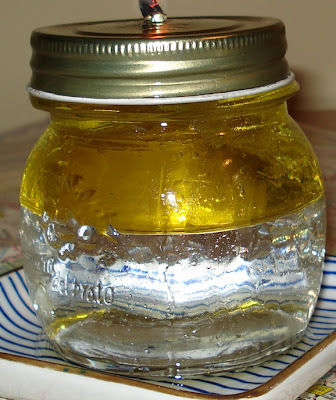 Using half water half oil means you have less oil sitting in a jar for long periods. The oil will warm up a little when the lamp is in use and this might mean it would go rancid over a period of time. The amount of oil in the lamp above burned for many hours. Oil: I used olive oil because it burns clean with no smell and it has a high flash point. That means is won't catch fire easily, it just burns the wick slowly. You could also use rice bran oil, another clean burning oil with no smell. You could use old cooking oil but it will smell of whatever you cooked in it. This is a nice little lamp that could be used for emergency lighting or could replace paraffin candles, which, if you burn them every night, cost a lot over the course of a year. Paraffin is made with petrochemicals, so you probably want to replace your paraffin candles with something that better suits your simple life. 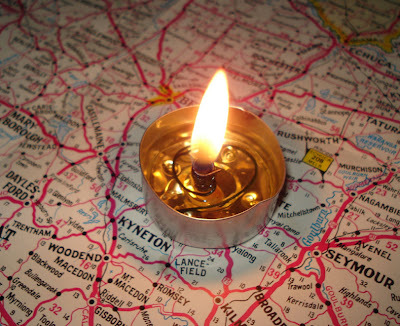 Mother Earth News did an article here a couple of weeks ago about oil lamps that is worth a read. They did a different version of the lamp, which I tried and it worked well. I put mine in a recycled aluminium candle holder (above), they put theirs in a canning jar which I think would work better over a long period. I just wanted to test the idea of it. This is nothing major, it's just another small step towards a better life and serves to remind us that we don't have to buy every thing we need. Many things can be made at home and used for their purpose without it costing too much at all. I perform well under pressure, always have done. When I have to work to a deadline or have a lot of things to do I get more done than when I can take my time and finish when it feels right. I prefer not to work like that now because I find that focusing on my tasks and taking my time with them is more enjoyable and makes me calmer, but when there's a lot of complex work to be done, if I'm under pressure, I will get more done. All through the year we've been working to deadlines for events and outings, and there has been work, lots of work, every week. The last of the big things happened yesterday. Kerry, my younger son, stayed here over the weekend and will travel to New York today. He stays there for a few days and then goes to Toronto where he'll work for a few months. Later in the year, he'll take a road trip with some friends to Las Vegas and then go to Brazil. It was good for me having him here. He relaxed, talked, organised and packed and I realised how matured and prepared he is for this trip. When he drove out the driveway with Hanno yesterday afternoon on his way to his brother's, I felt as if the last of the big events was over. I breathed a sigh of relief. But, there is always something lurking in the wings. On Friday, the book proposal came back from my agent. Now it's full steam ahead to finish the proposal, and then complete the book. It's becoming a bit of a saga but now I feel I have a clear space, both in reality and in my head, so I can give it all the time it needs. I want to make it the best it can be, I want it to help those who buy it and I want to be proud of what I put into it. I finished my first Burke's Backyard article on the weekend and sent that off. I feel really good about writing for that magazine and I hope to add something to their mix. That article will be in their Spring/September edition. Hanno and I took our god daughter, Casey, out for lunch on Friday. Casey was hit by a drunk driver a couple of years ago and she's now in a wheelchair. She is 25 years old. 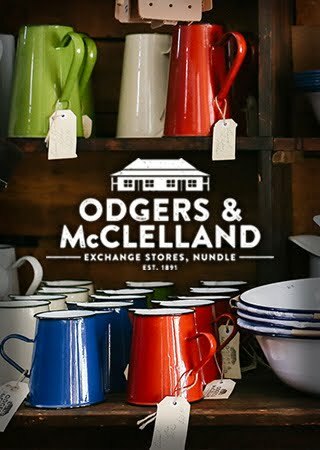 The place we went for lunch was having a Christmas in July celebration when we got there and it reminded me to blog about a home made Christmas. I wrote about this last year and think it would be a good idea if we all thought about our Christmas lists now so we can get ourselves organised and start making our gifts. I will be doing some knitting and sewing and there may be a couple of plants in nice pots. I'll work out a list during the next week so I know exactly what I have to do and will, hopefully, be on target and not rushing at the last minute. This can be such an enjoyable task but it can be spoiled by having to rush, or worst still, not getting the gifts made and having to buy at the last minute. I love receiving home made gifts. I love giving them even more. I know that thought, time and loving effort have gone into those gifts and feel a close bond to those I give and receive home made gifts from. I may be wrong but I think home made gifts will be big this year. So although this will be a busy week for me, it will be busy in a different way. I am looking forward to the next few months. I am usually fulfilled by my work and I hope the time and mental energy I put into my writing over the coming months results in something special. I have had a few emails recently asking me to write about various things and I wondered if might be a good idea to throw that open to you to compile a list of what you'd like me to write about. We'll set aside a week for readers requests when I'll write about the top five subjects. So if you have any ideas, let me know and if it's a popular idea, it might be in the top five. I hope you have a wonderful week full of rewarding work and quiet time when you can relax and enjoy your family and home. I received this comment the other day that I want to throw out to all of you for your suggestions. I was wondering if you (or anyone else) had some good ideas for simple activities/entertainment for children? My nephew is staying with us for the summer (his dad is in Iraq) and we're a little lost about what to do with a 5yo boy who's far away from home and has no idea about our lifestyle. We're planning to teach him to ride a bike (I got him one for his birthday) and swim but other than that we can't think of many things that don't involve a television. Lauren, when my boys were 5 I taught them simple cooking - scrambled eggs, toast, making breakfast cereal, sandwiches etc. You could also give him a strong flashlight for spotlighting in the backyard at night. If you're out of the city, he'll see all sorts of interesting things in the trees and bushes when it's dark. But my main suggeston is if you have a digital camera, teach him to use it on the automatic setting. Get a small note book and let him document his summer, in photos, for his Dad. Maybe one day he could take a photo of his surroundings or his family and write a short caption; the next day you could take a photo of him playing, reading, eating, sleeping or smiling. I'm sure his Dad would love that and he would probably get a kick out of it knowing it was a gift for Dad far away in Iraq. So now it's over to you, dear readers, what are your suggestions for Lauren and this little boy? Our no spending mission ends today. I know a few of you had to make small purchases but you got back on the horse and trotted to the finish line, congratulations. No spending helps us think about why we spend and it shows that we can stay at home and that our lives don't have to revolve around shopping. I'd love to hear a few of your stories. Did you find it difficult? Were the family on board too? This is the last of our current series of kitchen table talks. I thoroughly enjoy it and hope you did too. I am often thanked for what I put into this blog, but the truth is that you give me inspiration, and good ideas with your comments, so I think it's a two way street; all good conversations are. Thank you all for taking the time to comment. It lets me know you're out there and that others are walking this path along with us. So how do we round off a series that has talked about disposables, green cleaning, money, home production and a few other topics? I think the perfect way to end is to examine our feelings about our homes. Home is the central point for me. It is where I feel the most comfortable, and where I live each day according to my values. We are our true selves here, this is where we reveal who we really are and it's where I share common ground with Hanno and my family. And it is where we celebrated one of the most important events in our lives just a couple of weeks ago - the marriage of our son Shane to his beloved, Sarndra. So just in those few sentences I've revealed a few of the reasons my home is important to me. I have lived in many houses over my many years and I know that it takes work to make a dwelling a real home. In the first couple of years we lived here, when I was still working outside the home, I saw my home as just a place to sleep. I thought excitement and fulfilment waited for me in other places. It was only when I started doing my own housework and shopping, that my view of home changed - an along with that I changed too. I finally realised that my home was a reflection of who I am and making it comfortable, secure and warm, made me that way too. Our home is not fancy by any stretch of the imagination, it is what it is because of our gardens, the homemade goodies inside, the smell of home cooking, welcome mat at the door and the unwavering certainty that in this home we work to produce as much as we can for ourselves. That work gives us independence, makes us self reliant, and rewards us with a self made home that fits us like a glove. Your home should reflect you and your family. 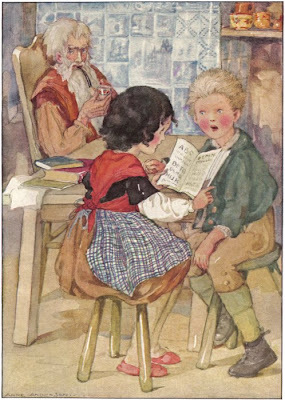 It should be the one place where you can kick off your shoes, sing at the top of your lungs, sit quietly with your thoughts and a cup of coffee, raise your children in safety, make things you can and can't buy at the shops, welcome your family and friends with cool home made fruit cordial in summer and hot and hearty soup in winter. Your home is the place where it's okay to put up red curtains against a purple wall, or live surrounded by stark, white minimalism, if that's what you want. Your home should be a safe haven where you can close the door on everything that is outside and feel secure and comfortable. And if you make your home everything you want it to be, and if it nurtures you and your family, when your children, your partner and yourself set off into the world from a home that is loved, you're setting everyone up for their best chance of success. I hope this series has helped you think about your home in a positive way, enabled you to make the changes you need or given you the confidence to not change what is loved. There are many important and significant things we will do in our lives, making a good home is one of them. It won't happen overnight but if you put the work in and if you march to the beat of your own drummer, you will be rewarded with the best possible place in which to live your simple life. Take care, everyone and have a lovely weekend.